Relax in your bathtub! These headrests have been specially designed and hand-made in Italy, with an ultramodern polyurethane gel, giving the headrest its ‘shape memory’. Compatible in any square bathtub, and perfect if you’re looking for head support lower than on the edge of the bath. Highly durable, resistant, and elastic, these non-toxic headrests won’t require an adhesive to stick and adhere perfectly to all stone and acrylic bathtubs. Comfy and soft, these headrests don’t break and maintain their temperatures much longer than others. Available in any color, the headrest is constructed using a gel which allows the light to filter through it, creating different shades. 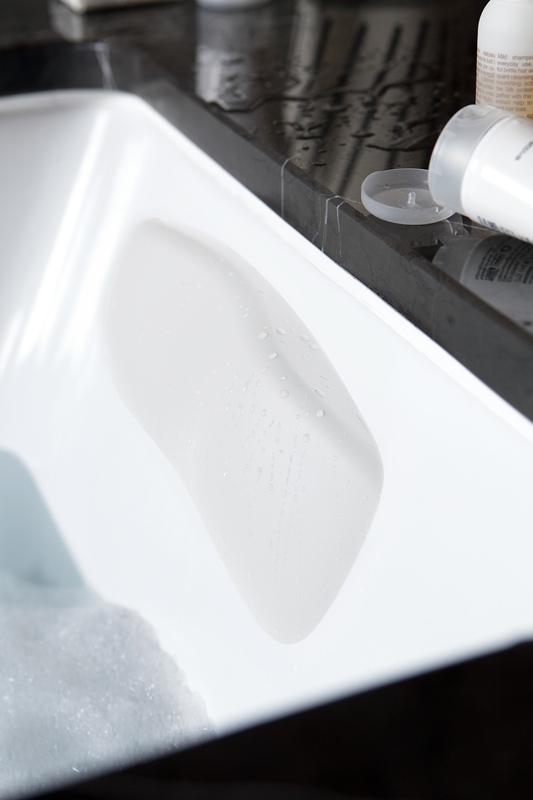 Crafted and molded into many different shapes and sizes, which are compatible with bathtubs, they have a thicker lip or edge, or more narrow lips. Not only is the memory foam that we have created, durable, resistant, and elastic, but is also completely non-toxic. (4) Air dry. When the product is completely dry, you can reposition it. Make sure that the tub is clean when you place it back on." Having used the pillow once, it works well and looks better than a suction-cup pillow. It may not be suitable, however, for households where the tub is used by those who might want to move or remove the pillow fairly often.